De Volksrant wrote published an article on Dutch robo-journalism, where I’m featured on explaining our SMART Journalism recommender system + abstractive summarization plans. M. Sappelli, D. M. Chu, B. Cambel, D. Graus, and P. Bressers, “Smart journalism: personalizing, summarizing, and recommending financial economic news,” in The algorithmic personalization and news (apen18) workshop at icwsm ’18, 2018. In the latest AI Podcast, I am featured, talking with Li’ao Wang on our SMART Radio and SMART Journalism projects. Stream the episode below! More specifically, it describes how my multi-disciplinary background, with an academic background in media studies, professional experience in the media, with a PhD in computer science, is important in bridging the gap between ‘techies’ and ‘non-techies’, and of particular value in my current role where I work on enabling AI in media. In the context of a high-profile legal case (involving a bunch of data acquired from encrypted “Ennetcom” phones) I assisted lawyer Inez Weski in acquiring insights and trying to understand how digital forensic tools were used in the collection of digital evidence. I did this work in the context of my PhD research on semantic search for E-Discovery. In this post, I list some of the publications that followed from my work and the case. Hansken is the search engine developed by the Netherlands Forensic Institute, and used by the police and public prosecutors. In this article in De Volkskrant, titled “Met deze eigen zoekmachine spit de politie schatten aan digitaal bewijs door,” I answered a few questions and explained my view on the role of Hansken in the court of law and digital evidence acquisition. Interviewed in RTL XL’s “How it’s done” on data science for news analysis. In RTL XL’s “How it’s done” me and Company.info’s CTO Henk Pijper explain why and how we apply AI and data science at Company.info to gain insights from online news. Author dvdgrsPosted on October 24, 2018 October 24, 2018 Categories MediaLeave a comment on Interviewed in RTL XL’s “How it’s done” on data science for news analysis. 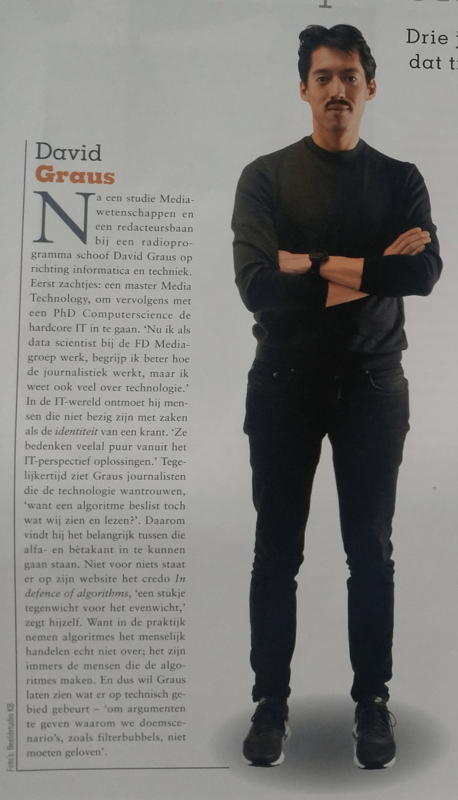 Article on ‘robo-journalism’ in NRC Handelsblad, titled “Waar blijft de Nederlandse robotjournalist?” where I briefly mention our SMART Journalism project. My debut on national TV ;-)! Denktank is a TV show where youngsters explore and think about how (current day) technology will affect them in the future. In this episode I explain some of the mechanisms behind algorithmic personalization. Stream the episode at NPO.nl (the part with me starts at about 05:00), or see the website of Human for more information on the episode. De mogelijkheden met data gaan verder, stelt Graus. Stel dat op basis van gedrag van vrienden, familieleden, likes, posts en zoekopdrachten wordt geconcludeerd dat je rookt. Terwijl je dat zelf nooit hebt aangegeven. ‘Daarmee geef je privacy weg’, aldus Graus.